Upon arriving in Hong Kong, the first thing on my mind was taking a photo of Hong Kong’s aerial skyline from Victoria Peak. 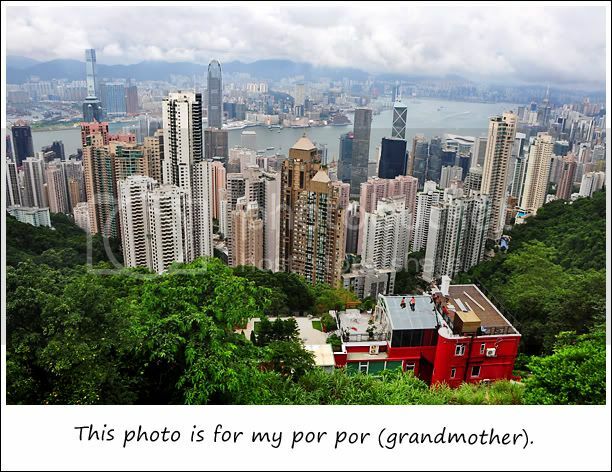 It is the view of Hong Kong that must not be missed. No wonder there’re throngs of people going up and down the hilltop at any given time. 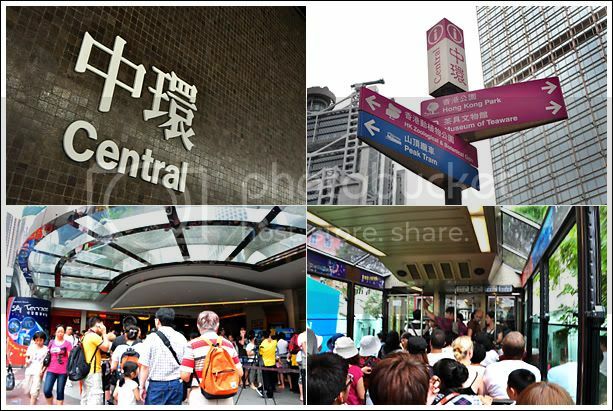 Getting There : From Central MTR Station, take Exit J2, and turn right once you come out of the exit. Walk in the direction of the iconic Bank of China building. Along the way, there’re many signposts to point you to the Peak Tram Terminus on Garden Road. It is pretty straightforward. There’re a few ticketing options available such as a single trip or return trip on the Tram. And you can choose to include the entrance fee to The Peak’s Sky Terrace as a package as well. I bought the 3-in-1 combo from the Madame Tussauds ticketing counter by the side. 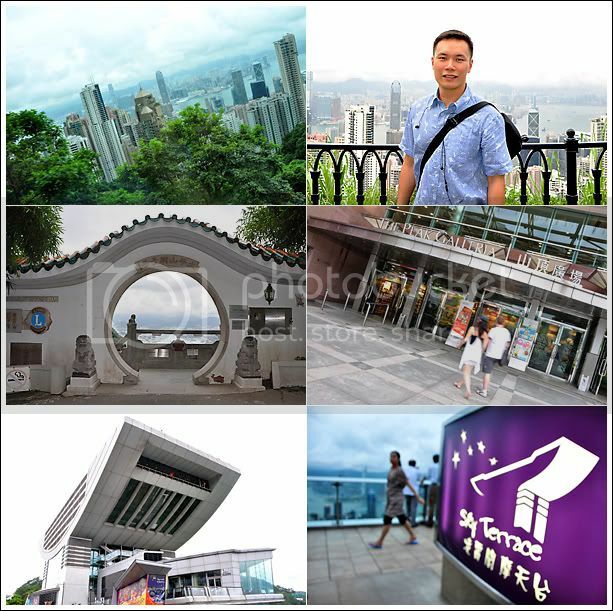 That includes a 2-way Tram transfer + entrance fee to The Peak Sky Terrace + entrance to Madame Tussauds (HK$200). MT is located inside The Peak Tower. • Sit on the right-hand side when going up and left when coming down. That way, you can see the skyline of HK unfold by the window. The slope is rather steep and at some points, the angle of elevation is about 45 degrees so it’s kinda bizarre to see the surrounding residential blocks slanting at that angle. The effect is more dramatic when coming down as it looks as if the buildings are ‘falling’ towards you. • When planning a visit, do allocate extra waiting time for the Tram. I waited about 30 mins to board on the way up (about 5 pm), and almost an hour on the way down at 9 pm. 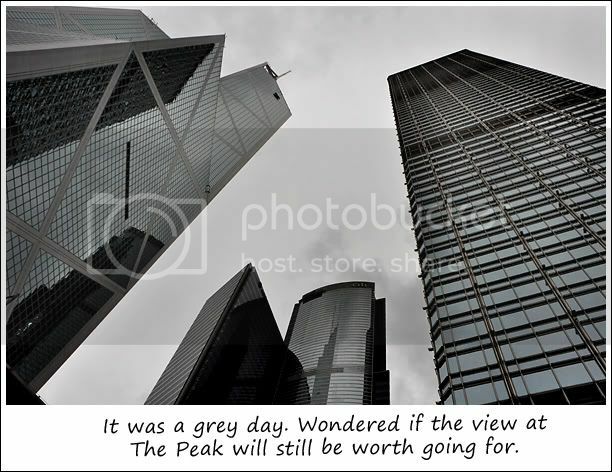 There’re two shopping complexes at the top – The Peak Tower and The Peak Galleria. Both offer lookout points on their roofs. The Peak Galleria is free but since it’s behind The Peak Tower, the view is slightly blocked. But it offers a great view of the surrounding islands. The Peak Tower’s Sky Terrace offers an unobstructed view of the skyline for a fee of HK$25 (adult) and HK$12 (child and senior). A short walk in the downhill direction will bring you to a lookout point called the Lions View Point Pavilion which is also free. 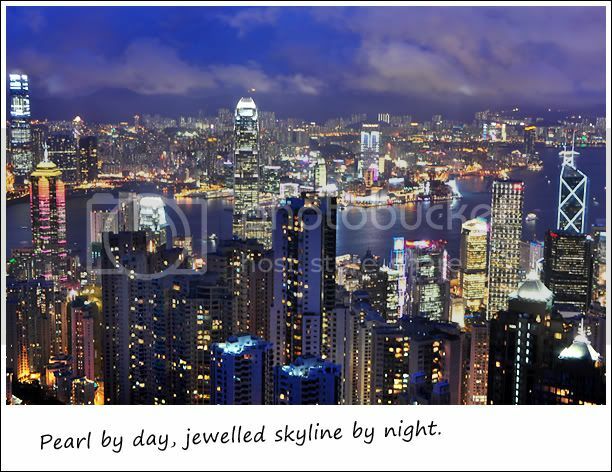 My photo of the skyline taken during the day was at Lions while the night view was taken at the Sky Terrace. • In summer, the sky starts getting dark around 7 pm. That’s when the lights on the buildings start coming on too. I was there at about 6.30 pm to stake out a front row spot for the view. • At 7.30 pm, there’s a photo service that charges HK$120 to have your photo taken with the night skyline. Choose a spot just out of the camera range so as not to be chased away. Apart from taking in the aerial view, you can also shop at the two Peak complexes and visit Madame Tussauds. It was really magical watching the Hong Kong skyline transit from day to night… almost as if it took off its business suit and donned on a Technicolour coat to party!